← I can do it myself! 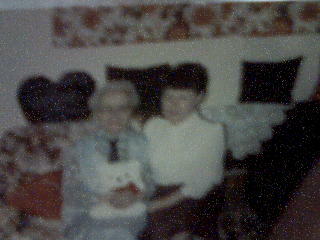 This is a picture of my mother and grandmother. As I awoke this morning there was this constant tug at my spirit that I was to share with you the most difficult piece I have ever written among all of my blogs. I am being called by my Father to tell you about my mother’s love. My Mom was a special creation. My stepfather would often say to me in remembering my Mom, “Kevin, when God made your mother, He threw away the mold. “He was right. Mom was to me a combination of being a counselor when I needed a listening ear, a nurse when I would fall and scrape my knee and need a band-aid and a woman of a rare internal beauty. She taught herself how to paint landscapes from the art books she purchased. She would often go without many of the luxuries other women were enjoying to afford her art books. Mom sacrified much for herself so as a teenager i would receive my First set of Funk & Wagnalls encyclopedias. Mom would be elated like it was Christmas morning when a new art encyclopedia would arrive. She trusted me even as a child to leaf through the stories about the different artists like Rembrandt, Picasso, Gaugin and Davinci. 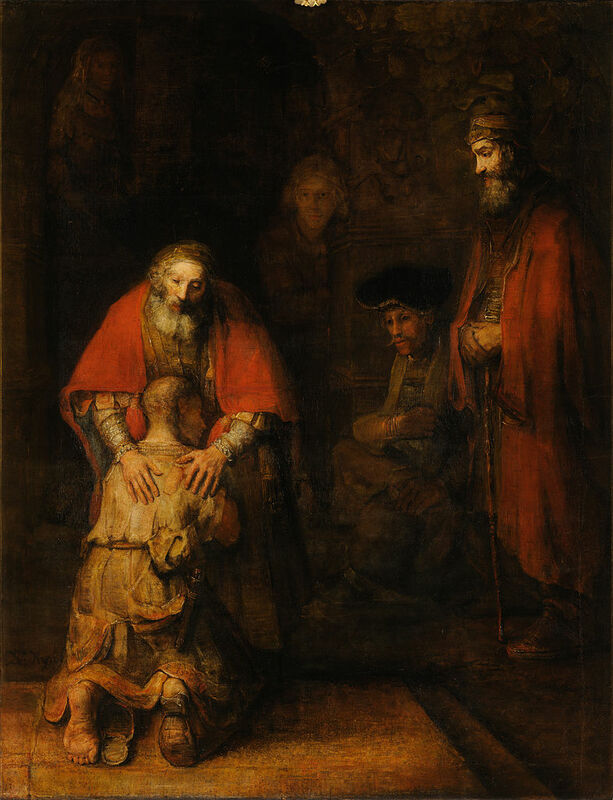 The beauty of Rembrandt’s painting of the Prodigal Son stands out in my mind. The musician Michael W. Smith says the Parable of the prodigal son should be the story of a father’s extravagant love. A wayward son living a reckless life returns home not to scorn, but to the arms of a father’s love (Luke 15:11-32), Please take time to reflect upon the love the father shows the son. Our Father’s love is like that. He holds you in His arms of love whenever you need His extravagant love. In reflecting upon my Mom she was a work of art – a masterpiece of love, grace and beauty in her Master’s hands. I loved her so much that even as I write this piece tears come to my eyes. Yet, with them in my Lord’s mercy comes beautiful memories of laughter and singing songs together like Amazing Grace . Her rendition of How Great Thou Art was filled with a boundless love for her Lord. Mom encouraged me in my singing and writing. She told me the Lord gave me a gift that would be used to heal many wounded hearts. I thank my Lord with all humbleness for being able to sing and write about His amazing love for me a sinner saved by grace – the grace of a Savior’s tender and compassionate love. After 27 years of being away from school my Mom went through an intensive preparation of many weeks of study to be accepted into Seneca College of Applied Arts and Technology in Toronto. She studied to the point of exhaustion, often laying her weary head on the dining room table with her math book beside her. I would pray for her as she slept that God would allow her to pass her entrance examination into Seneca College. Mom’s stomach felt a gnawing nausea the day of her exam. I assured her that whatever happened I would love her just the same. Mom’s haunting fear of failure hung over her like a dark cloud. My father in his sickness of manic depressant schizophrenia abused her so much emotionally and physically that it wore away at her self-confidence and sense of self-worth. My beautiful mom, ever the fighter was hoping and praying that she would pass the exam that she was told many fail the first and even the second time they are tested. She was determined she would make my stepfather and me proud of her. We were proud of her already. Weeks went by as we all waited for the letter to arrive with her test results. Week after week and day after day my Mom would check the mailbox. No letter today. No letter the next day. No letter that week or the next. Finally, the letter arrived. Mom performed well as we all expected she would. She graduated from academic upgrading in subjects like math, science, sociology, English, bookkeeping, typing and accounting with a 97.5 % average. These are two highlights from Mom’s time at Seneca that stand out in my memory. Her thoughts on race relations prompted Gordon Orr, who was her sociology professor, to rewrite two chapters of his book on race relations. The second memory is the art lecture mom gave on landscape painting. Students were standing outside the classroom getting as close as they could to see or even hear my mother’s lecture. Students hearing that mom was going to be giving a lecture on art skipped two of their classes to attend it. She came home surprised that so many valued what she taught them. I wasn’t because I knew what my mom was capable of. In assessing my Mom’s ability in English her teacher had to start her three quarters of the way through her English grammar book. Mom was told that she had the equivalent knowledge of English and writing as a university graduate. These next words are so difficult to write. Mom experienced a massive heart attack three days before Christmas 1992. My stepfather, George, called out to her thinking mom went into a deep sleep. He said, “June. June! June! ! No response, not even the sound of one reassuring breath. Dad shook her and shook her again. He called 911 and immediately started performing CPR. I fight back the tears as I write this. God’s message must get out. The Enemy won’t have the victory. There is a message of love and healing many need to hear. My stepfather later told me what happened.The paramedics arrived. They worked feverishly as they tried to shock my mother’s heart to start again. Finally, a deep sigh of relief came as they got Mom’s heart started again. Dad didn’t want me to see what was happening. I still remember as if it was yesterday my mom’s ashen face with the paramedics racing the stretcher past me. Mom was wearing an oxygen mask. She looked so pale. My heart pounded. Thump. Thump. Thump. In my icy fear I cried out to God in the silence of my terror . “Lord, please let mom live! I don’t want to lose her! Not now. Not this way.” Tears welled up within me. I fought them back as best as I could. I must be strong for my stepfather. Through my own tears I said, “Dad, mom wouldn’t want to go on this way. We need to do what is merciful. Sign the DNR order.” Something within me told me that soon Mom would be going to her heavenly home. Dad shook his head in agreement. With a shaking hand he signed the DNR order. Shortly thereafter, Mom had her third heart attack. We were told to say our good-byes. First, Dad went in. As he came out I hugged him as his tears soaked my shirt. Then, it was my turn. That ER room was as chilly as the Arctic Circle. It felt cold and clinical. There was no warmth in that room. Mom was laying there on the metal examination table. Still. Silent. I walked over to her and held her hand. Tears came in torrents. I saw her wedding ring. The small diamonds in it were my reminder of how God had shaped His beautiful work of art. She married my stepfather in 1980 after divorcing my father for physical and mental cruelty. Two young sweethearts who met when Mom was 16 and my stepfather was 21 had said their good-byes. Now, it was my turn. Part of me thought this was some surreal dream I would wake up from. Surely, this wasn’t happening before my eyes, but the bitter reality was that it was. As I held my Mom’s hand suddenly I could feel her fingers touch mine. There was a warmth to her hand that defied reason. That warm hand was God’s gift to me. My Lord allowed me the opportunity for one last fleeting touch of a mother’s loving warmth. Mom was only 57 when she died. She’s in Hevaen where her pain is no more, where there is no heartache, no more soul-crushing sadness, no more sorrow. There is only the wonderful exuberant joy of her Father’s perfect love. My Mom was far from perfect, but she was perfect for me. Not all of us have been blessed to have such a loving mother as I was. Yet, for reasons I don’t yet fully understand the Holy Spirit moved upon my heart to tell you about my mother. I pray with all of my heart that my thoughts about my mother ministered to some hurt in your own life. No matter how badly you were treated remember this truth. Just as my mom was a work of her Master’s hands, so too are you. He loves you even if you don’t love yourself. Your Lord wants you to pour out all of your pain to Him to heal you as He is healing me. Mom was a work of art and so are you. Please prayerfully reflect on the words of the hymn Have Thine Own Way. Let Christ have His way with you today .You are His work of art. Posted on November 5, 2013, in On Relationship and tagged abuse, academic, accounting, Amazing Grace, anatomy, Arctic Circle, Art, art books, artist, beauty, blog, blogging, bookkeeping, brain, breath, chilly, Christ, christianity, christmas, clay, clinical, compassionate, counselor, CPR, creation, dark, Davinci, death, encephalitis, encyclopedia, English, exam, fail, failure, faith, father, Gaugin, gift, God, Grace, graduated, grammar, grief, hands, healing, hear, heart attack, hearts, Heaven, high school, honors, horror, How Great Thou Art, hurt, inspiration, intelligence, landscape painting, laughter, lecture, letter, life, light, Lord, loser, loss, love, loving others, make, manic depressant schizophrenia, Master, masterpiece, memories, ministered, mold, mom, mother, mould, nausea, neurologist, nurse, oxygen mask, pastoral care, perfect, Picasso, picture, potter, pray, Prodigal Son, professor, proud, race relations, rare, reflecting, relationship, Rembrandt, sad, Science, self-confidence, self-worth, Seneca College, sick, singing, sinner, sociology, Son, sorrow, spiritual, stepfather, still, Stories, students, sweethearts, teacher, tears, thoughts, touch, truth, typing, university, upgrading, warm, weary, wedding ring, will, Work, wounded, Writing. Bookmark the permalink. 29 Comments. Thank you Kevin for the healing words. I know that recalling all this but it is healing and it is a reminder of the things I sometimes take for granted. Thank you for reminding me that it is not to late. You’re most welcome. It’s never too late to heal from any pain in your life. If it can happen for me with all I’ve gone through it can happen for you too and all of us who need a touch of the Master’s hands. Thank you most kindly for the reblog. It fills my soul with great joy that the story of my love for Mom is getting out to wider circles. As Michael W. Smith says, it’s a healing rain. Let it pour down, Lord. Let it pour down. Ur very welcome, have a blessed week. Have a light-filled week yourself! This was a wonderful tribute and a powerful testimony of God’s power to heal and restore. Thank you for sharing. Thank you for the well-summarized thought of what this piece was all about. I was very touched by your comment. Thanks for the smiley face. It brightened my day! Thanks for your most touching comment. A marvelous honoring of your mother. Blessings on you. Thanks Jim for your touching comment. Thank you most kindly. I’m glad my story moved you. This is such a powerful tribute to your mother. Sounds like she was an amazing person. Thank you for sharing this. Mom was an amazing person. i was touched that another person wrote to me expressing that having read my story the individual said that a healing journey was not too late. If I had touched one soul that in itself would have been worth the heartache I went through writing this piece. I am so deeply moved that so many are writing to me about how the story of my love for my mother moved them. The writing I did today with all the difficult places it took me to had to be a touch of the Master’s hands. To God be the glory. Thanks for sharing thoughts from your own heart. Thank you so much for sharing the beautiful memories with us. May God bless you richly as you grow in HIm. You’re most welcome. Thanks so much for the prayerful thought. God’s richest blessings to you as well as you grow closer to His heart in your daily walk with Him. Thank you for following my blog. But you? out of all people? Your writing skills exceed mine by a long shot! Also it seems like your posts are at a better quality than mine. How did you find a blog like min? Okay you really don’t have to answer that question if you choose not to. But I really thank you for showing me you love my blog, and enjoy your posts. Thank you for your touching comments. Lovely authentic piece. Thank you for sharing. Thank you for the kind compliment. I hope the piece speaks a message of hope and healing to many. As I wrote to one commenter it’s never too late to heal from a wounded past. It is my prayer that although this was a tough piece to write its message will continue to spread. Please feel free to reblog it or any of my other pieces, which you feel would help others in their journey. Thank you most kindly for the reblog. You are most welcome Kevin! I’m glad the story moved you and causes you to appreciate your mom even more. Mom was all those things she said she was and so much more. I was such a blessed son that God gave me such a loving mother. He gave me such a gift in her that helped me deal with the awful things my manic depressant schizophrenic father said about me. In a manic rage when my father criticized me for being too stupid to tie my own shoes mom went out and bought me oxford shoes I didn’t have to tie. Mom told me God had gifted me as a writer and a singer. She poured countless hours into spending time with me to develop these gifts. She approached my teachers about developing a special curriculum that focused on how people like Louis Braille and Helen Keller overcame their challenges. I saw through reading those stories how one person with a determined will can make a positive contribution to society. Like Jimmy Dean says in the song “I.O.U.” the total cost of my mother’s love was no charge.